The global Directed Energy Weapons market, valued at US$1.68 billion in 2017, is projected grow at a CAGR of 11,5%, to value US$4 billion by 2025. The cumulative market for global expenditure on Directed Energy Weapons is valued at US$21.1 billion over the forecast period. Directed Energy Weapons are attracting ever increasing R&D funds and there is no military organization and branch that’s not looking into ways to integrate them into their arsenal. 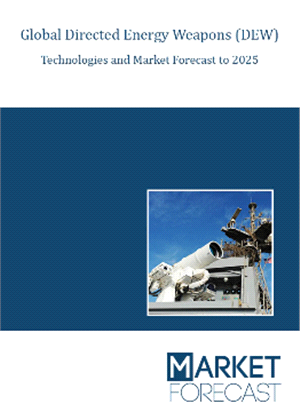 This new, multi-scenario forecast examines, analyzes and predicts the evolution of Directed Energy Weapon technologies, markets and outlays (expenditures) over the next eight years 2017-2025. The report examines regional aspects of these markets, focusing on the top 95% by value, in the United States, Europe and Asia. Airbus, Boeing, IAI, Lockheed Martin, Leonardo, MBDA, Northrop Grumman, Rafael, Raytheon, Rheinmetall, Saab and Thales.